I visited Farmoor again this morning. It was mostly sunny but a light northerly wind took the edge off the temperature. 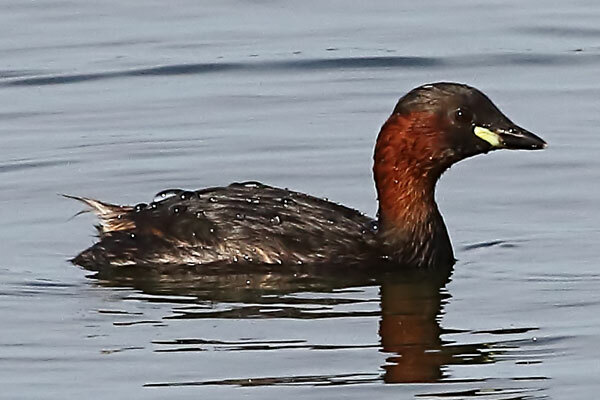 The first bird of note that I saw was a Little Grebe, still in summer plumage. It was very wary but I did get a shot of it. 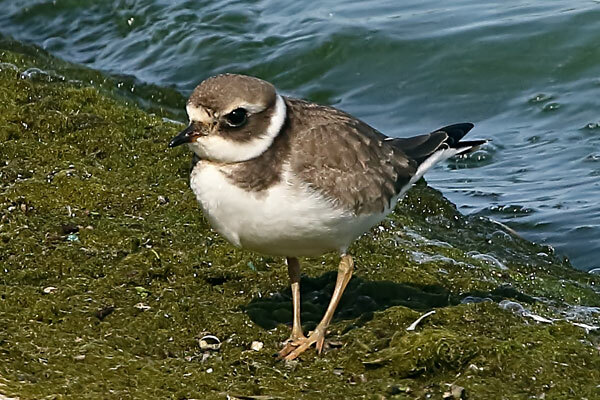 Further along the causeway I found a juvenile Ringed Plover which was very confiding. 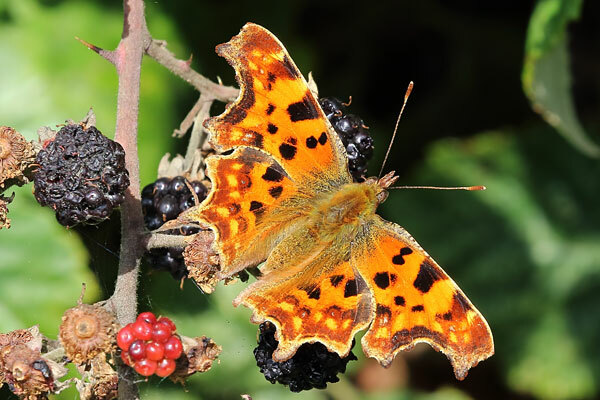 Moving down to the Pinkhill hedgerow I heard a Great Spotted Woodpecker, and saw a Comma sunning itself in a blackberry bush. There were a couple of Willow Warblers in the trees by the hide. I found a couple of Migrant Hawkers where the feeding swarm had been on Tuesday. By the river past the water inlet I was fortunate to find a Migrant Hawker hovering at just the right height, with the river in the background. That produced my best ever in-flight pic of a dragonfly. 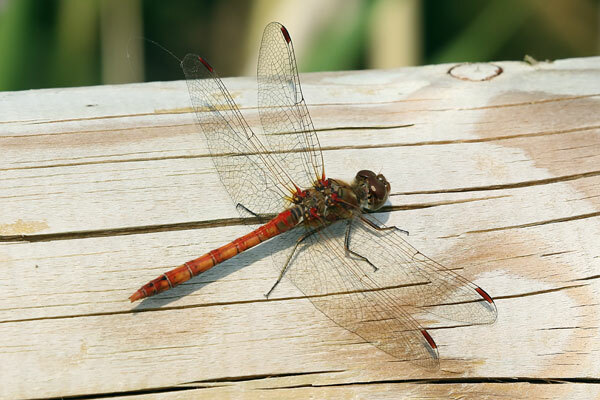 For some reason there were far fewer Common Darters about today - I only saw two. However I did see a couple of Brown Argus and Red Admirals, which had not been there on Tuesday. On the way back to the car park I saw a few Swallows and House Martins, the Greylag x Canada Goose and finally the juvenile Knot, which was still extremely confiding. I visited Farmoor this afternoon. It was mostly cloudy, but when the sun did come out it felt quite warm. 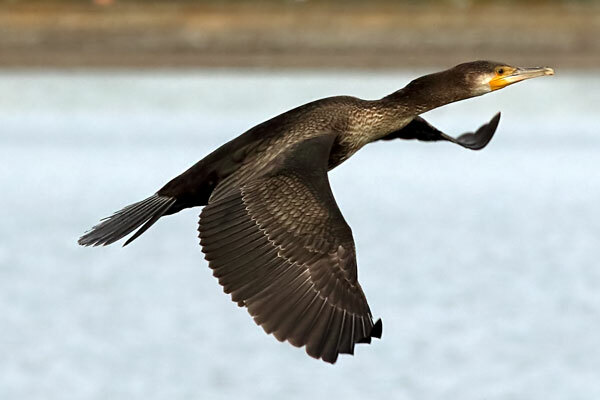 There were many Coot, Mallard, Greylag Goose, Cormorant and Tufted Duck. 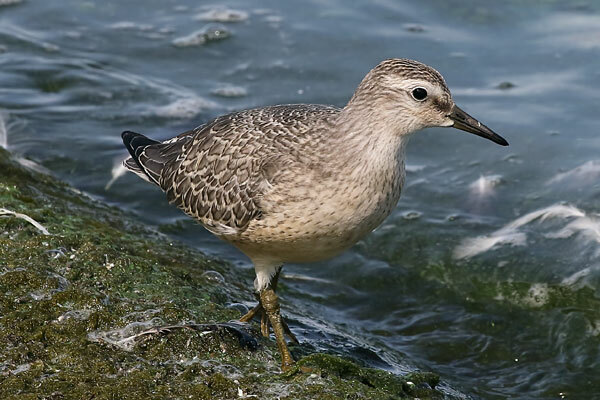 As I walked along the causeway I found a Ringed Plover and then a juvenile Knot. Both were pretty confiding. Going down to Pinkhill there were several small birds in the bushes but I was only able to identify a Whitethroat. I did start to see Common Darters, a species I'd almost given up on this year. 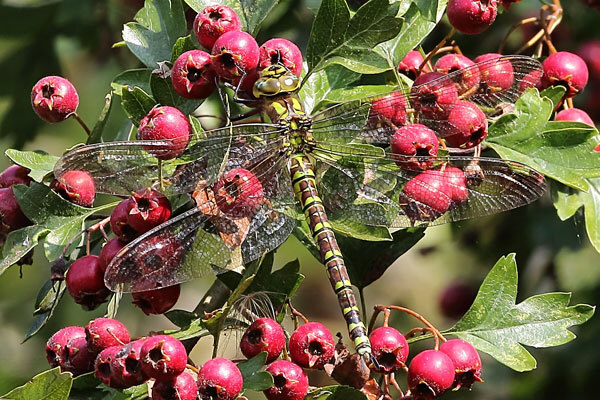 At the north end of Pinkhill there were eight or more Migrant Hawkers in a loose feeding swarm (a very late emergence for this species as well). There were several Green-veined Whites and Speckled Woods about. 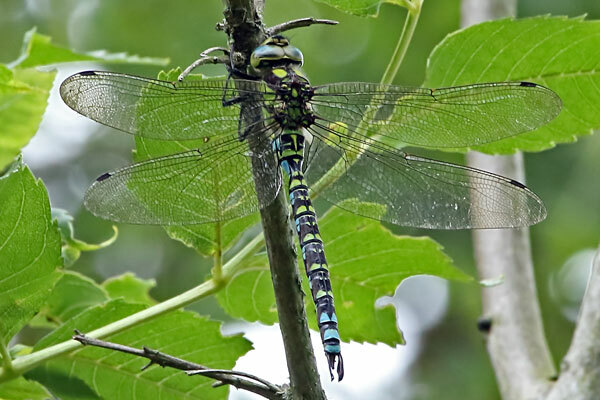 On the way to Buckthorn Meadow I saw a female Southern Hawker and a Brown Hawker. 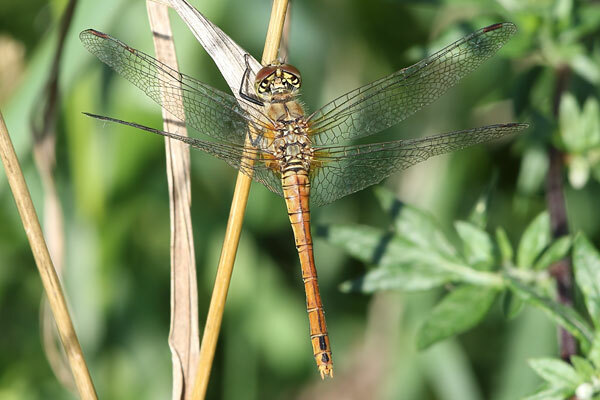 At Buckthorn Meadow there were two pairs of Common Darters in tandem, with the females ovipositing. 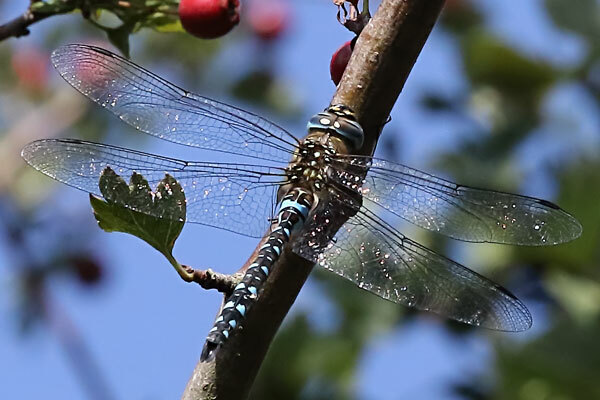 I spotted a very nice male Southern Hawker in a hawthorn bush, but it was flushed by a rather tatty Brown Hawker (which I was able to photograph). Back up on the reservoir I saw my first Kingfisher of the year! On the way back to the car park I saw a few Yellow-legged Gulls on F2, and around twenty Lesser Black-backed Gulls out on F1. A fairly chilly morning, but it was sunny, so I headed for Standlake Common and Pit 60. When I got to the gate leading to the Langley Lane hide a large flock of House Martins was flying above the lane. 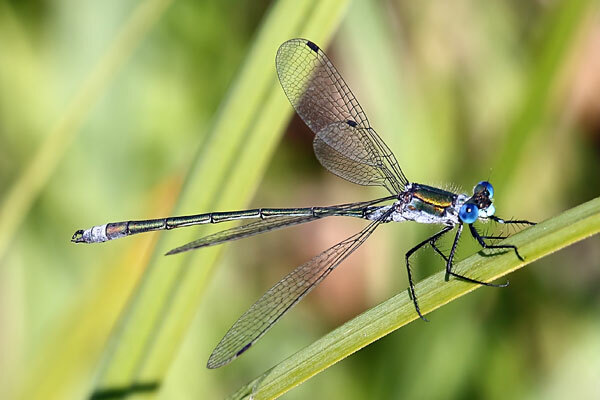 Walking down the lane turned up a few Common Blue Damselflies, several Speckled Woods, a Southern Hawker, a Migrant Hawker, a Chiffchaff and a Roe Deer. The water level on Pit 60 was lower than I'd ever seen it before. 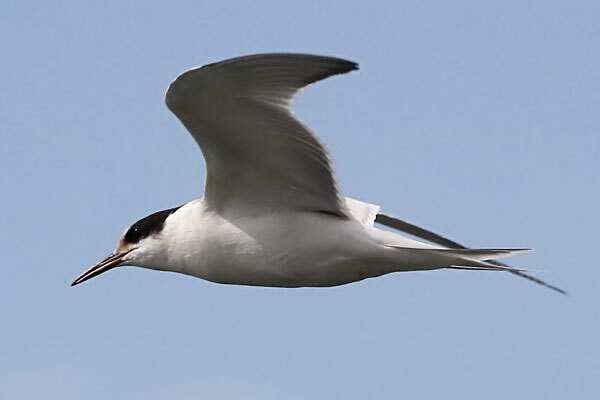 House Martins were zipping around the hide and out over the water, and there were some Sand Martins present too. I counted 71 Mute Swans on the lake. The only species of interest that I saw were a Little Egret and a Green Sandpiper, neither of which came close to the hide. There was lots of Water Mint in flower in front of the hide, but the only butterflies I saw on it were a fresh Small Tortoiseshell and a Meadow Brown. 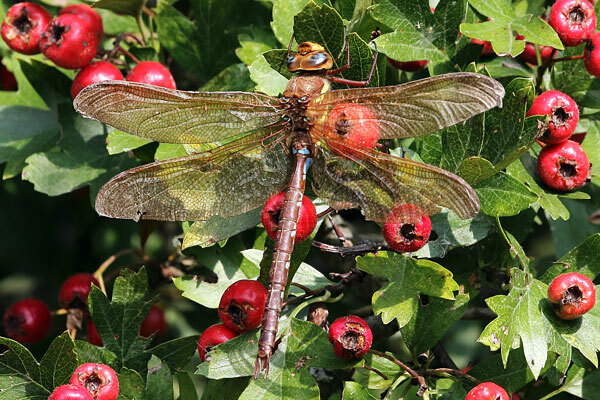 As I went back up Langley Lane I saw more Speckled Woods, some Green-veined Whites, another Migrant Hawker, a fresh Comma, and some Common and Ruddy Darters. I walked along the path to Shifford Lane, spotting a Great Spotted Woodpecker on the way. There were more Commas, Speckled Woods and Green-veined Whites, one Red Admiral, one Holly Blue and three Brown Hawkers. On the way back to the car I noticed that the bushes along the lane were covered with fruits - Elderberries, Blackberries and Haws mainly. There were several stands of wild Hops as well. 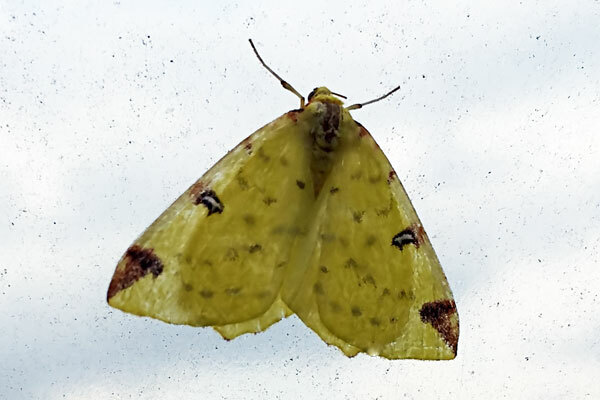 I found a Brimstone Moth in the polytunnel at the allotment this afternoon. Today was the final butterfly survey of the year on the MoD land at Otmoor. The weather didn't help much, being mostly cloudy with some drizzle. But it was quite warm. Common Blues and Speckled Woods were the most numerous. 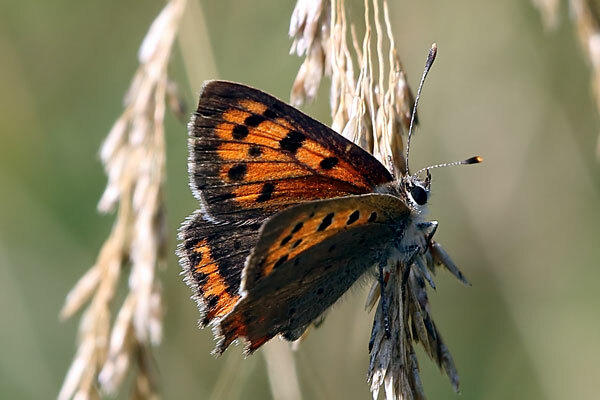 Eight other species were seen, including two Brown Hairstreaks and four Small Coppers. 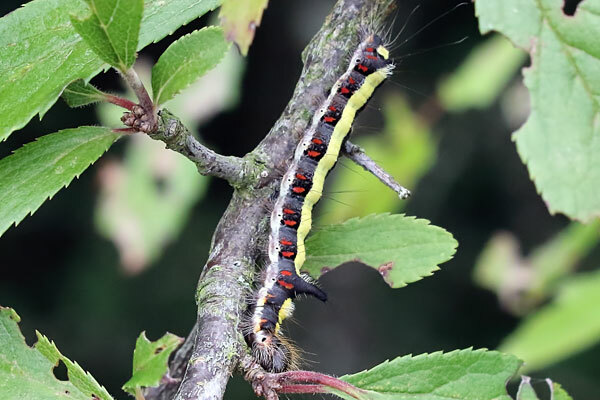 A probable Grey Dagger larva was found on Blackthorn. Ruddy Darters were quite numerous, but I only saw a couple of Common Darters. 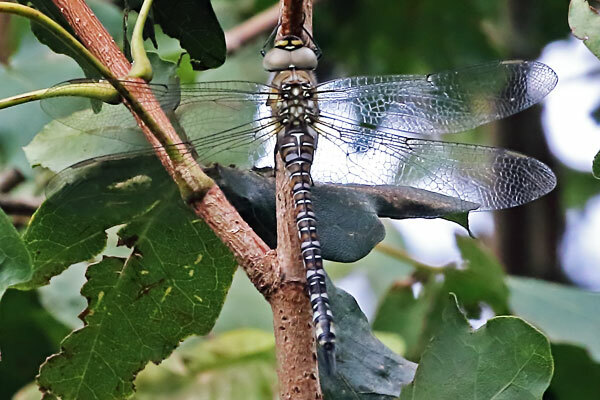 I also saw half-a-dozen Migrant Hawkers and a Southern Hawker. I saw a Hobby in Saunder's Field. As I was leaving there were two Brown Hares in a field. I had a walk along the roman road and round the car park field. For some reason Common Darter numbers were higher here. 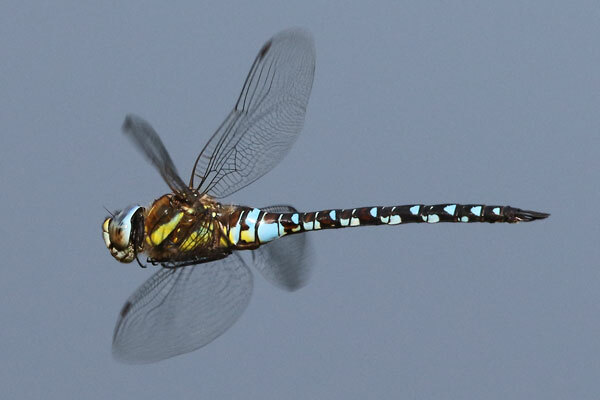 I also saw three Migrant Hawkers, one Southern Hawker and one Brown Hawker. 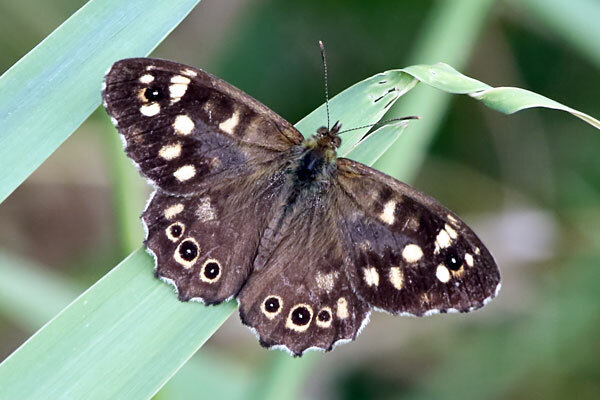 Speckled Woods were the most numerous, with a dozen seen, and there were also eight Green-veined Whites and a couple of Commas. I visited Farmoor again this morning. It was rather windy, around 19°C with 100% cloud cover. Not a great deal had changed since last Thursday. There were dozens of hirundines over F1, mostly Sand Martins and House Martins with just a few Swallows. There were four Swifts over F2. In amongst the large flock of Tufted Ducks I found a male Pochard. 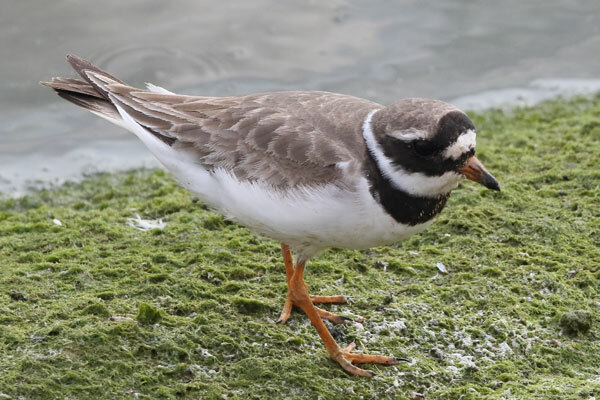 There was one Common Sandpiper on the north shore of F1, and a Yellow Wagtail amongst the Pied Wagtails on the eastern slope by the water works. 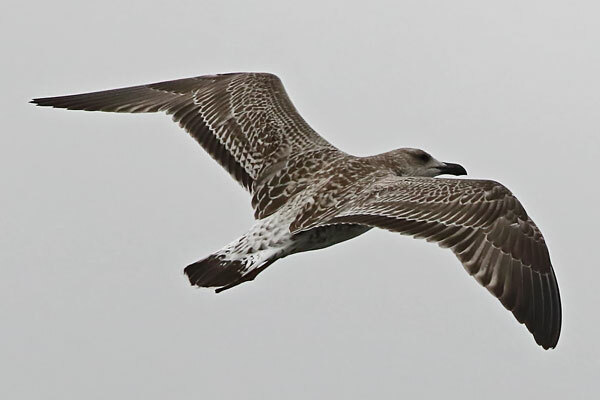 I saw a Great Black-backed Gull, and two adult and three immature Yellow-legged Gulls. Another cloudy, warm and humid day. There were quite a few Small Whites (two were in the polytunnel) and a Red Admiral at the allotment in the afternoon. I also saw a Kestrel. After a wet morning I went over to Farmoor in the afternoon. The first thing I saw was a Red Admiral. 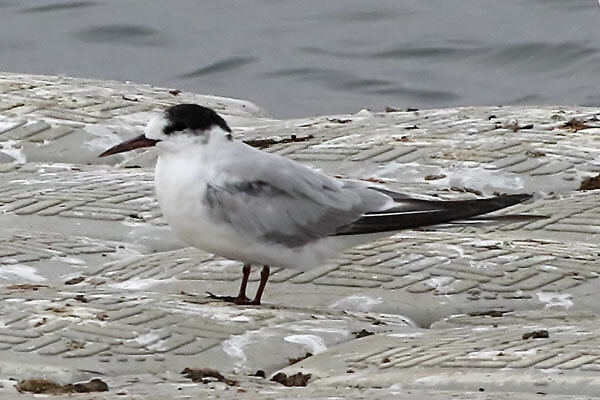 There were eight Common Terns flying around by the sailing club, and another ten on the pontoon on F1. There were lots of Cormorants (I counted at least fifty), Mallard, Coot and Greylag Goose. There were also quite a few hirundines, a mix of Sand Martins, House Martins and Swallows. I also saw one late Swift. 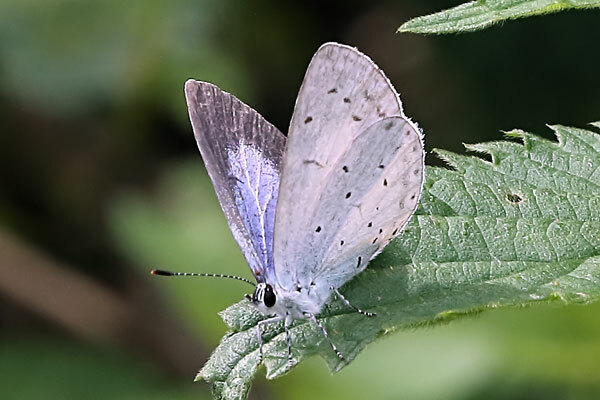 Between Pinkhill and Shrike Meadow I saw a female Holly Blue and four Speckled Woods. Dragonflies were a bit thin on the ground: five Migrant Hawkers, one Southern Hawker and three Common Darters was all I could find. 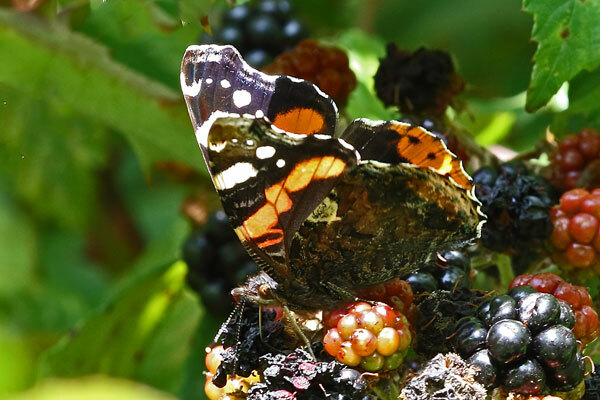 On the way back to the car park I saw another two Red Admirals. At the sailing club all the terns were in the air. 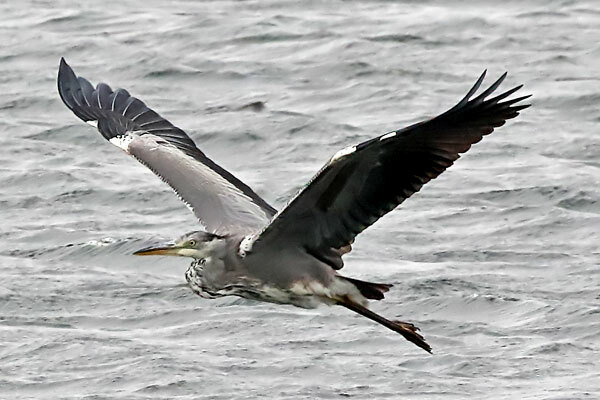 They weren't fishing, just flying about chattering to each other (and occasionally dive-bombing a gull). I suppose they were trying to decide if the time had come to head south. A cloudy but quite warm day. The usual whites were active on the allotment, and I also saw two Painted Ladies nectaring on buddleia. There were also two Small Whites in the garden. A mostly cloudy day. I saw a couple of Small and Large Whites and a Holly Blue in the garden, and a Migrant Hawker was overhead for a short time. After yesterday's rain and a cloudy morning, the sun came out after lunch, and so did the butterflies. There were quite a few Small and Large Whites at the allotment, and a couple of Large Whites and a single Small White in the garden. I visited Farmoor reservoir this afternoon. It was cloudy, breezy and about 20°C. The reservoirs were much fuller than I'd expected, given that we'd had almost no rain for two months. There wasn't a lot to get excited about bird-wise. 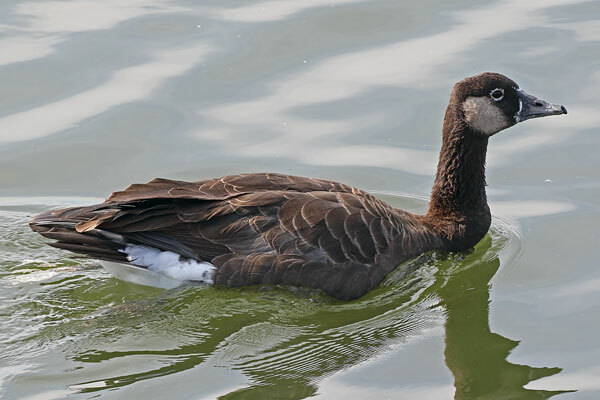 I estimated that around a hundred Coot and 120 Tufted Ducks were present, both quite large numbers for this time of year. There were quite a few hirundines, mostly House Martins with some Sand Martins and Swallows. 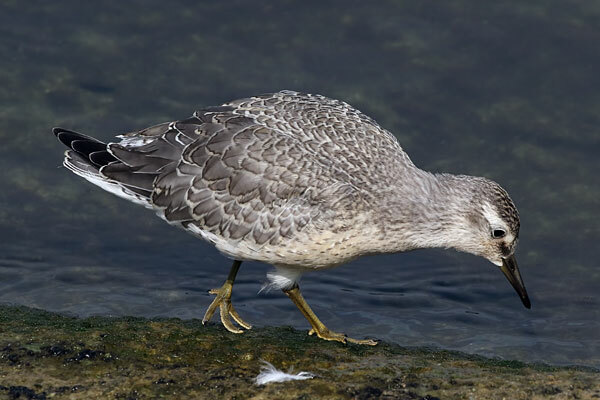 Gulls included Yellow-legged, Lesser Black-backed and Greater Black-backed. 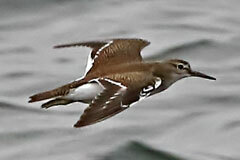 I saw four Common Sandpipers along the northern shore of F1, but as usual they were very flighty. 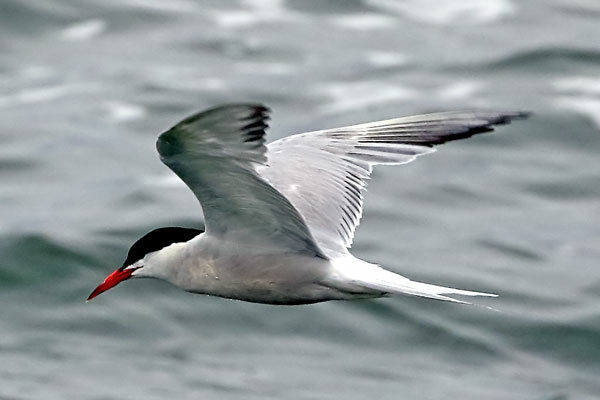 There were around fourteen Common Terns feeding by the sailing club, including at least four juvenile birds. 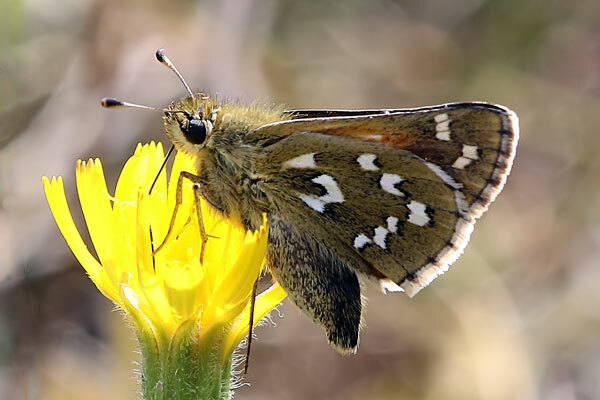 The last butterfly survey of Sandford Brake took place this afternoon. 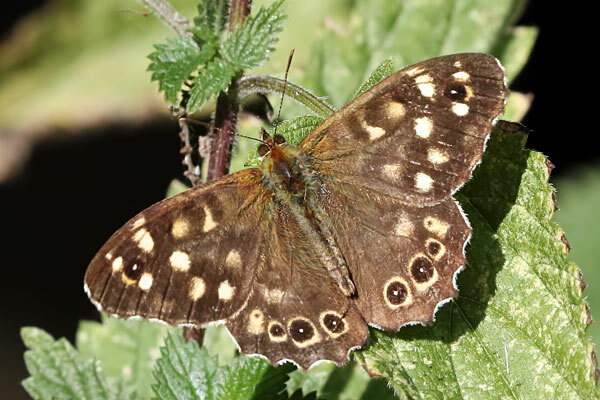 Despite the mostly cloudy skies we recorded ten species, of which the Speckled Wood was the most numerous with at least 25 seen, and a female Silver-washed Fritillary was the most unexpected. I visited the north side of Aston Rowant NNR this morning. It was quite warm again, with hazy sunshine. 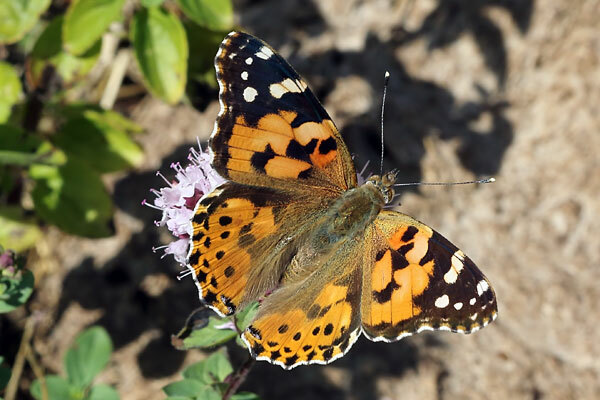 The south-facing slope of Beacon Hill was alive with butterflies. I don't think I'd ever seen so many here before. The most numerous species were Meadow Brown (probably more than 150 seen) and Common Blue (at least 100). 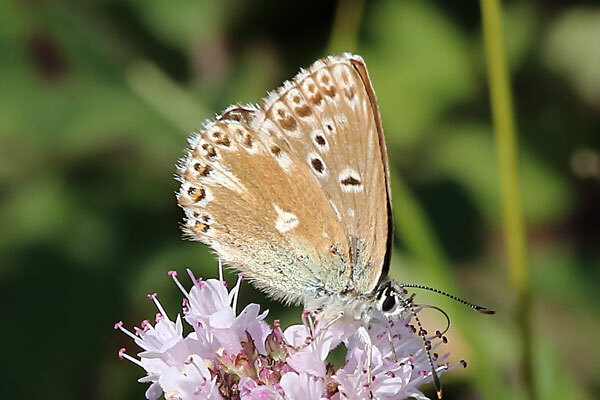 There were also many Chalk Hill Blues (some looking rather tired), Brown Argus (many were very small), and Small Whites. I found an aberrant female Chalkie which had no spots on its hindwing - possibly ab. postobsoletissima. 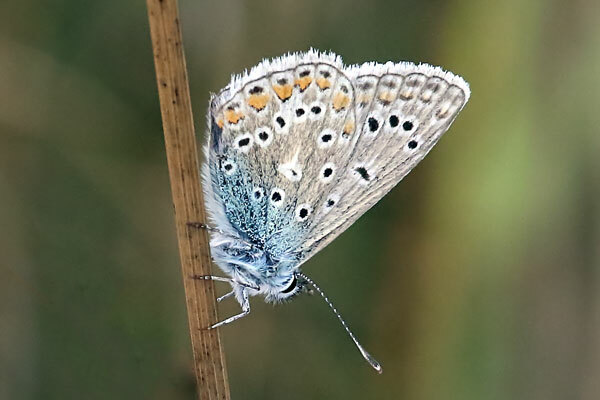 At the bottom of the slope by the sunken path Adonis Blues appeared, although I only found about a dozen. Silver-spotted Skippers were also numerous; at one point I saw seven in a procession - presumably six males pursuing one female. A clump of Majoram near the sunken path had at least fifty butterflies of different species on it. Other species seen were Speckled Wood, Gatekeeper, Small Copper, Small Heath and Green-veined White. However there were some surprising omissions; the only nymphalid I could find was a Small Tortoiseshell, and there were no Large Whites, Brimstones or Clouded Yellows. 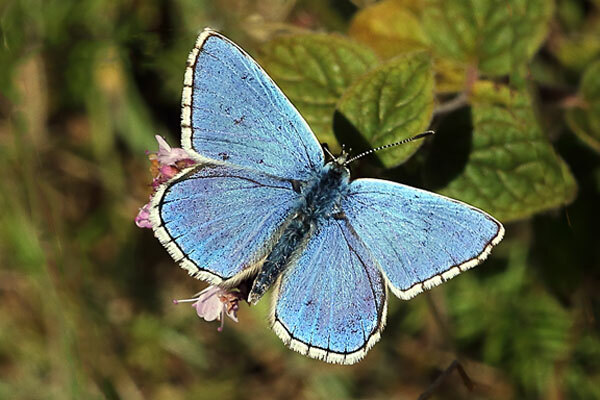 The penultimate butterfly survey of the year on MoD land at Otmoor took place today. Since my last visit the meadows had been cut, and the rifle range was full of Devils-bit Scabious flowers. Needless to say, brown butterflies had almost disappeared, with just a few Meadow Browns and Gatekeepers still around. 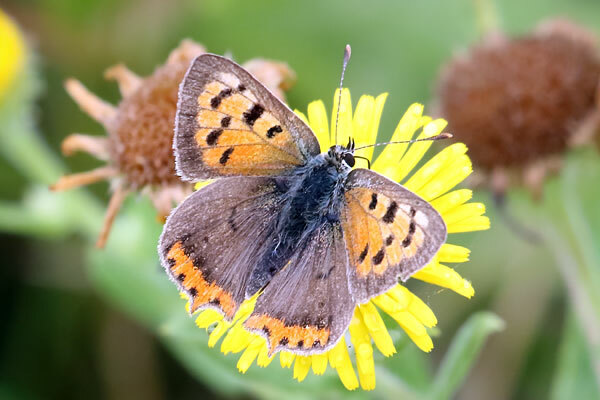 However, they had been replaced by Common Blues (50+), Brown Argus (10) and Small Copper (6). The sighting of the day was of a Clouded Yellow - my 51st (and probably last) British butterfly of the year. 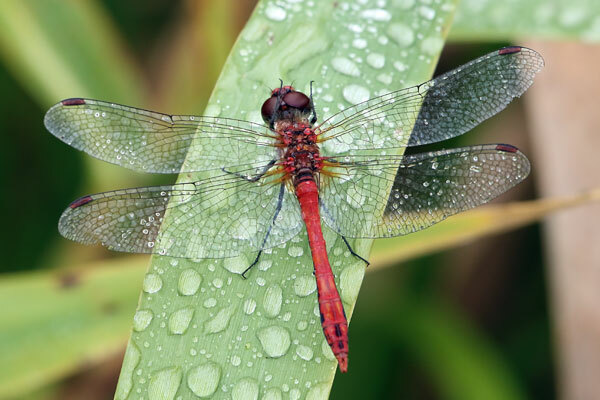 There were also many Ruddy Darters about, and smaller numbers of Common Darters, but only five Brown Hawkers and two Migrant Hawkers. After completing the survey, I walked down the roman road. 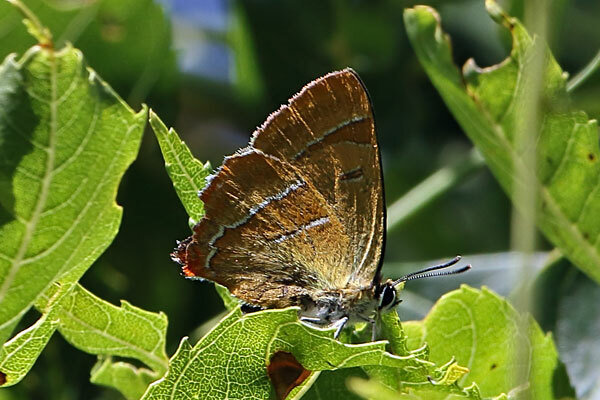 I found a very tatty Purple Hairstreak, before finding a male Brown Hairstreak in one of the Ash trees. A female also appeared, and came down quite low in the tree. 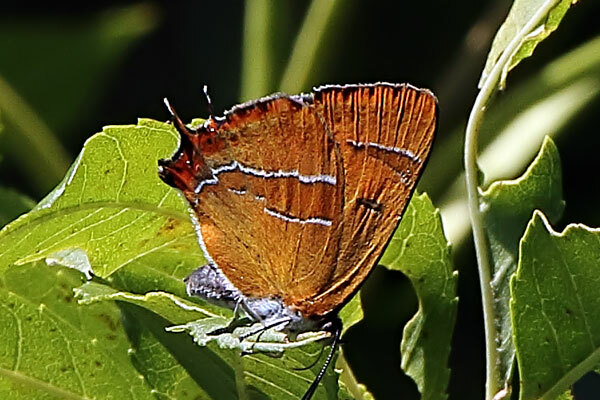 Three more males were then found, making it my most successful Brown Hairstreak sighting ever (my previous best was three). Walking round the car park field turned up a Red Admiral and some froglets. The moor itself was very dry and brown; I'd never seen it like that before. I spent a couple of hours this morning exploring the area between Orchard Lake and the Thames. Ruddy and Common Darters were quite numerous. 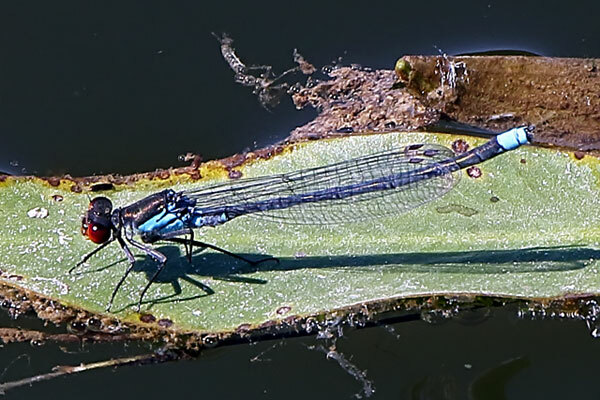 I saw at least nine Common Blue Damselflies, four Red-eyed Damselflies, two Blue-tailed Damselflies, three Common Spreadwings, three Black-tailed Skimmers, three Migrant Hawkers and one each of Southern and Brown Hawker. 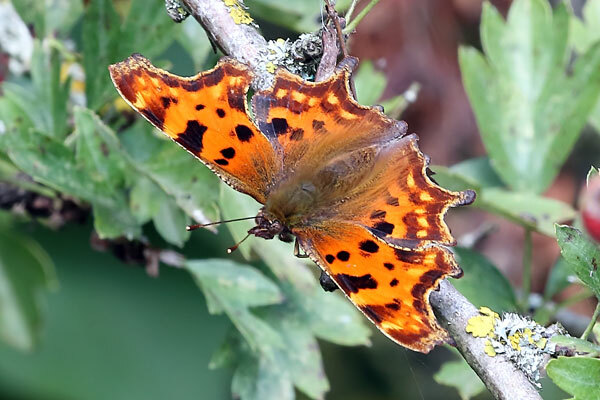 Butterflies weren't very numerous, just the usual species for this time of year, including one Comma and one Red Admiral. 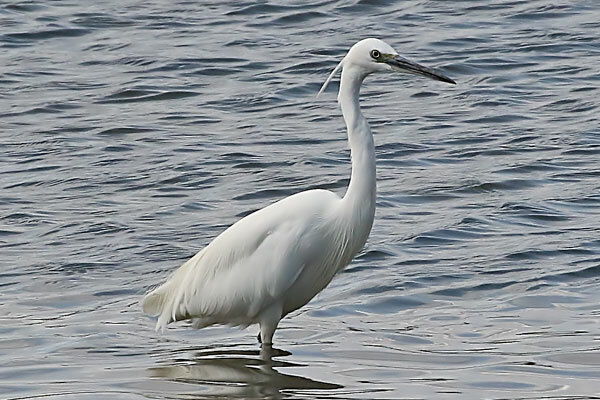 At the lake I saw two Grey Herons, three Little Egrets and a Green Sandpiper. In the afternoon a female Red Admiral visited the garden. She was looking for suitable plants to lay eggs on. The female Gatekeeper was still present at the allotment this morning, and a Brown Argus also showed up. 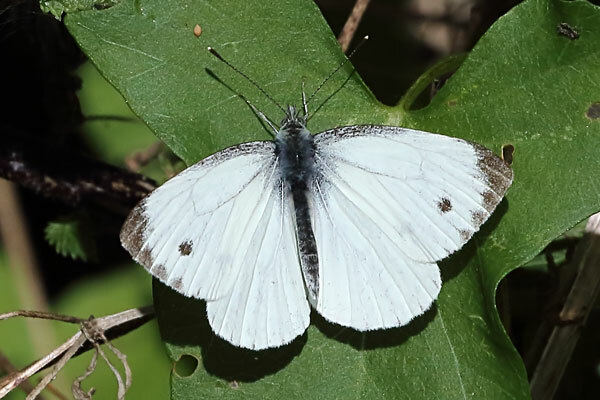 There was a Holly Blue in the garden again, and a female Green-veined White was surveying possible egg-laying sites. This morning I saw a female Gatekeeper and a Common Blue at the allotment, and a Holly Blue in the garden. I went to Lardon Chase this morning. The place was very dry, but there were some patches of Marjoram which attracted butterflies. There were lots of Common Blues and Meadow Browns about (at least a hundred of each), and at least sixty Chalk Hill Blues. I was looking for summer-brood Adonis Blues, and found at least eleven of them. I also saw two Small Coppers, two Painted Ladies and one Brimstone. 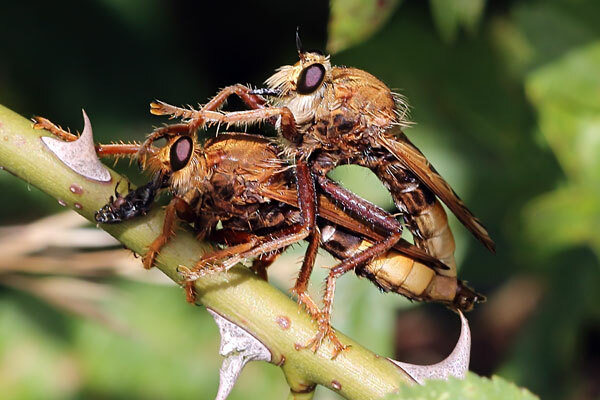 I'd already found one Hornet Robberfly, and on the way back to the car park I found a mating pair in the hedgerow. On the way home I stopped at Lid's Down to have a look at it. There was a path through it (about half-way down the slope), but although there were ant nests the grass was rather too long for Chalk Hill Blues. Still, I saw getting on for forty Common Blues and ten Brown Argus, and even a late Small Skipper. There were a few birds here, including a Whitethroat, five Linnets and a pair of Yellowhammers. 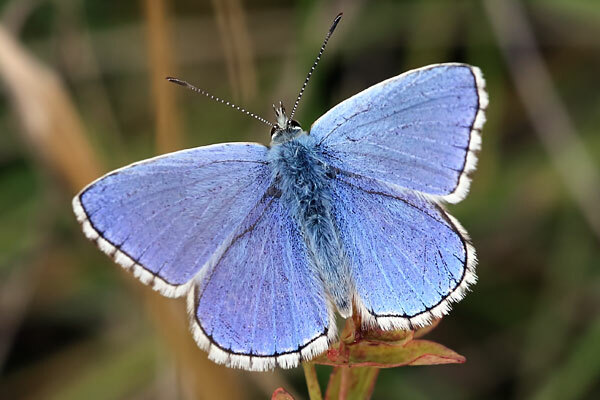 In the garden I saw a Gatekeeper and a Holly Blue, as well as the usual whites.